Most of Durban is hilly. The central suburbs lie inland from the beaches up against what is termed ‘the ridge’, with the university on one end and the suburb of Overport on the other. Accommodation ranges from beach side 5-star Durban hotels with sea views, to suburban bed and breakfast and self-catering venues in the leafy suburbs of Morningside and Berea. 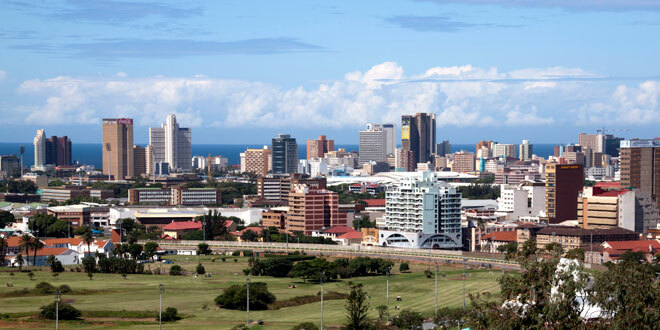 There is plenty to do and see in Durban, even if your aim is to soak up the sun on the beaches of the north and south coast. Visit the BAT Centre, uShaka Marine World, head down to the Point, which is now undergoing a complete resurgence, where the once run-down hotbed of local prostitution is now a series of new developments including restaurants and apartment buildings. Sample a local curry or bunny chow, and whilst in town head to the spice market so that you can try your own when home. Go on a township tour, visit local mosques, and the Temple of Understanding.